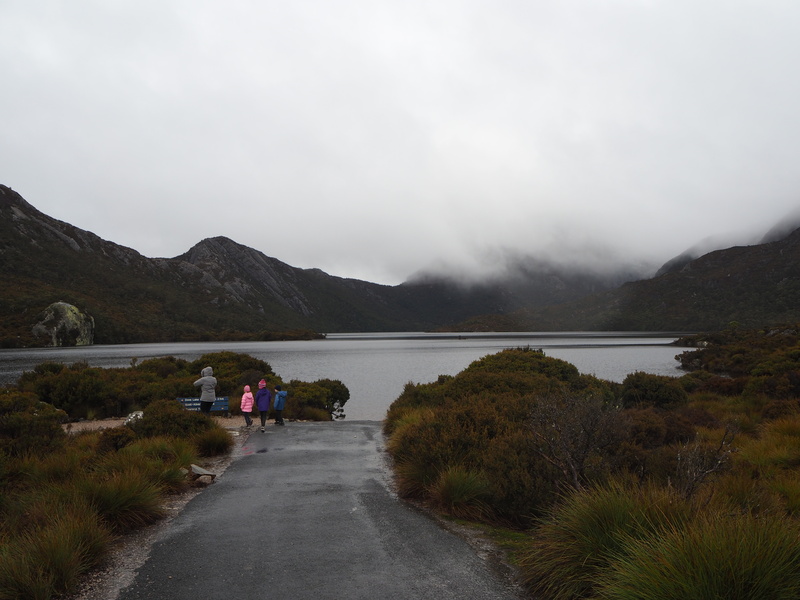 Unfortunately we chose the worst day to go to one of the most beautiful places in Tasmania, Cradle Mountain, but luckily it does not take away from the beauty of the place. 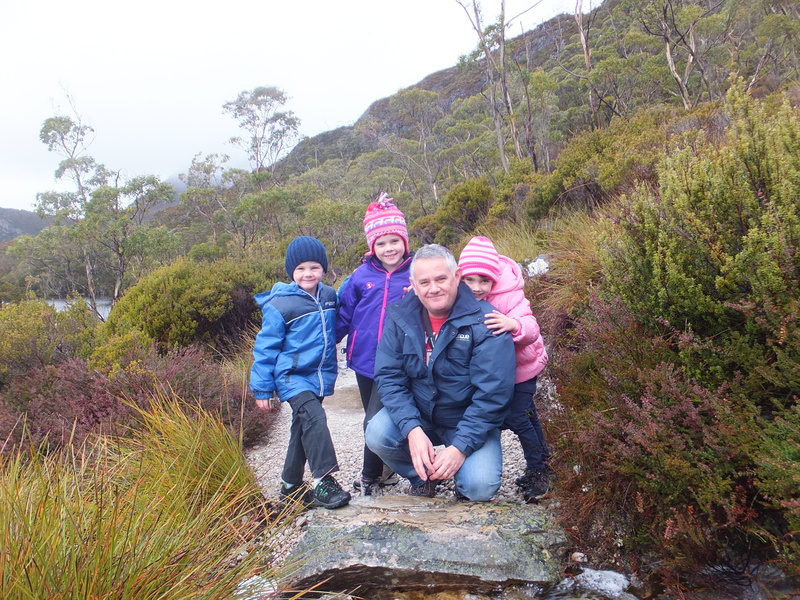 Cradle Mountain with kids is amazing, a prefect place for them to explore and get out and get dirty. I chose the Sunday as Craig was still in town and if it was snowing I wasn’t sure I would be confident to drive there. I didn’t want to drive all the way and turn around because I was nervous with the kids and weather conditions. We were staying at Swamp Cottage in Launceston which was a good 2 hour drive on winding roads and often inclement weather conditions. The kids and I went over on the Spirit of Tasmania with the car and Craig flew over the following night to meet us in Launceston. As it turned out (and I already knew this) it had snowed 2 days before we arrived. I was hoping that the snow would still be there and we would get the iconic snow covered Cradle Mountain shot that I had seen on Instagram a few days earlier. If you’re on Instagram check out @lovethywalrus & @itsworthashot for some truly brilliant shots of a snow covered Cradle Mountain. This however was not the case for us! We arrived to rain. A steady, consistent, sprinkling of it for the whole time we were there. This meant 2 things, firstly there was very little snow left and secondly we would have to walk Dove Lake in the rain. All 6kms of it! And we did, kids and all! There are so many amazing things to see in this part of Tasmania, Cradle Mountain can be included in an itinerary covering North West Tasmania, it’s the last part of Tasmania I have left to visit although I’m always happy to return to Cradle Mountain, a highlight of a trip to Tasmania. We were staying in Launceston so we drove approx. 2 hours to get there. It really was an average day so as we started to get closer to the mountain I was getting increasingly concerned that we weren’t going to see very much! The clouds were low and it pretty much rained the whole way. Its a pretty easy drive but parts of it gets a bit windy as you start to climb higher. You don’t need a 4WD to get there all cars will get you to the entrance of the Cradle Mountain National Park. Here you have to stop and pay an entrance fee to Tasmania Parks and Wildlife Service. We paid $60 for our vehicle and all 5 people inside. This also included entrance to Freycinet National Park, as I had planned to take the kids on the Wineglass Bay walk but unfortunately we didn’t get there this trip. I suggest that you only purchase this if you are sure you are going to make it across there. I often make this mistake, biting off more than I can chew and end up wasting the extra money I had to pay. Maybe next time I will learn. Visitor Centre Cradle Mountain, also a souvenir shop and cafe. One thing you will notice driving in Tasmania is the amount of road kill on the side of the road. I remember years ago driving at night and you would see the eyes of the tassie devils eating the road kill in your headlights. Tassie devils are currently on the endangered species list and therefore the road kill is not being naturally cleaned up, leaving the road kill pretty much in your face! When driving at night, you need to be extra careful, I had 2 near misses but luckily didn’t contribute to the road kill tally on this occasion. Once you have paid your entrance fee you can either drive your own car down to the lake or you can leave your car at the entrance and catch the courtesy shuttle bus. This is a good option if it is snowing and possibly at busier times as there isn’t a huge amount of parking at the lake and if you can’t find a park you will have to return to the entrance anyway and catch the bus. The courtesy bus runs every 20mins and stops off at popular walks along the way before the last stop at Dove Lake. The road down is really only suitable for one vehicle so you often have to pull over to the side and let the buses or other cars pass before travelling on. It takes about 15mins to get from the entrance down to Dove Lake. On this occasion we choose to drive down as there wasn’t a huge amount of people around being winter and we had just missed the bus and would have to wait for another 20 mins. Dove Lake circuit is by far the most popular walk and it the home of the iconic boat house shot. This is the main photo you see with Cradle Mountain in the background with Dove Lake in front and often the boat house. Its a 6km circuit mostly on a boardwalk or gravel path. 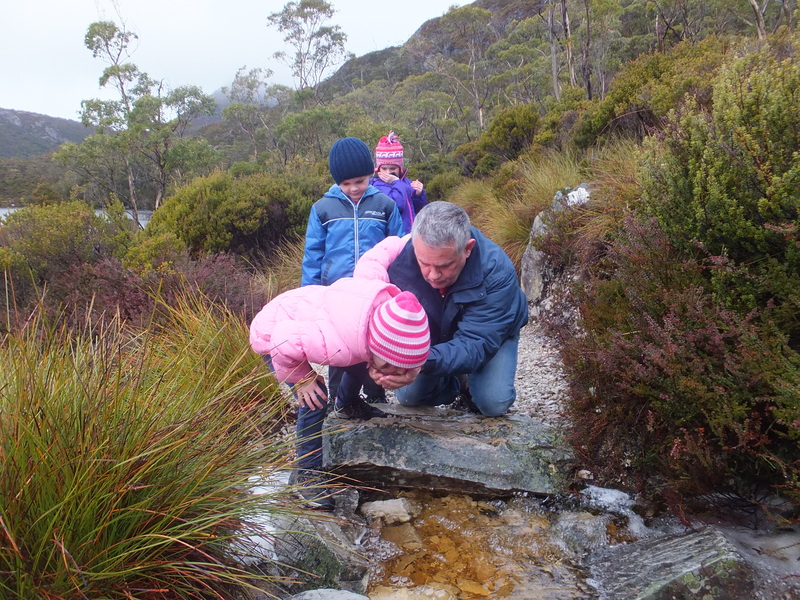 Its the perfect place to explore Cradle Mountain with kids as there is plenty of space for them to run around. The walk takes between 2-3 hours and is graded as easy but parts of it are challenging. The walk is designed to be taken clockwise but for whatever reason (depending on who you ask!) we went anti-clockwise which made it more challenging for us than it needed to be. Nothing further to be said about that Craig……. Unfortunately for us it was drizzling for 90% of the time we were on the track. The track during rain will have a fair amount of water flowing over it at places and the boardwalk will be a bit slippery so keep that in mind. The good thing about the rain is that it doesn’t take away from any of the beauty of the area. It really is a spectacular spot with the cleanest, purest water and air in the world. The kids had a drink of water from one of the streams and said it was delicious. it took us close to 3 hours to complete the circuit. Having a drink in the stream with Dad. Due to the weather conditions and the issue of one of the kids having a toilet accident while walking around we were unable to fit any other walks in while we were there. It was also pretty cold and wet so I think we had all had enough after our epic 6km walk. This was a shame as I had planned to do so much more including the Enchanted Walk and King Billy Walk which are both about a 30min return walk which would have been really manageable for the kids. There are loads of different walks of varying difficulty including the overland track which covers 65kms and takes approximately 6 days. Wildlife is abundant in the Cradle Mountain area particularly wallabies, pademelons, possums, echidnas, tasmanian devils and wombats. We must be very noisy as we were not lucky enough to see any animals. I was hoping to see a wombat as some had been seen recently but not this time. I took loads of photos while we were on the track, these are some of my favourites which have mostly already been uploaded to our Instagram page. 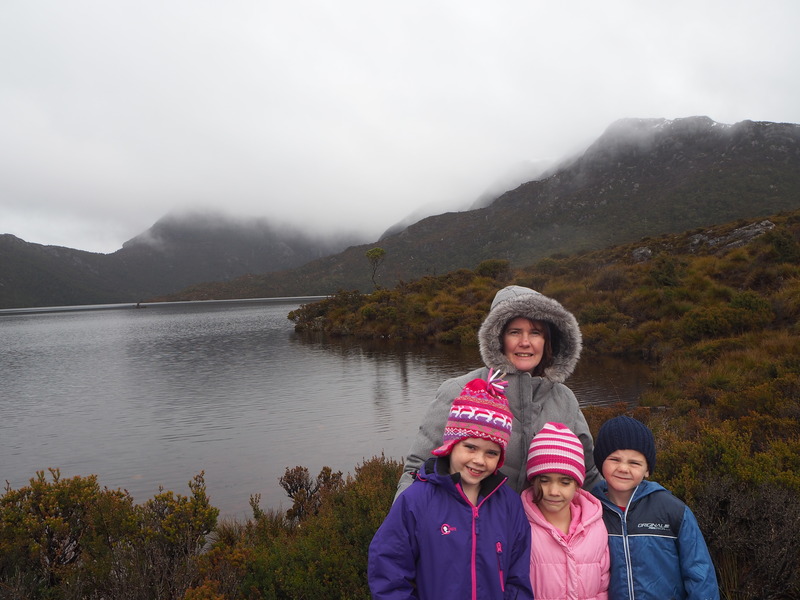 Rugged up for our 6km walk at Cradle Mountain. The iconic boat shed shot in front of Cradle Mountain. The clearest shot of the Cradle we were able to get! We enjoyed having dad there for the weekend. 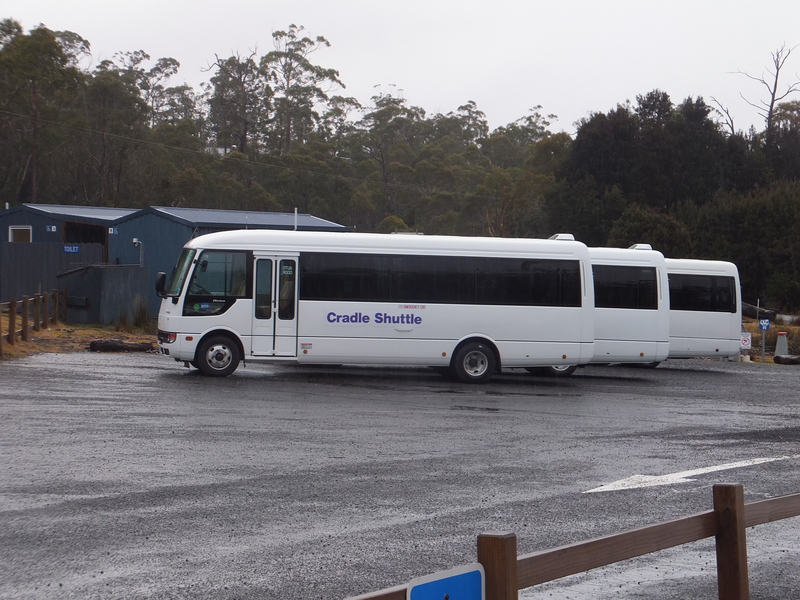 If you do head out to Cradle Mountain, factor in some time to stop at Mole Creek Caves, it only takes and hour or two and its a good learning experience for the kids. I love Tassie and have been there 4 times now and this visit won’t be my last. In fact I’m in the process of organising a girls trip to Hobart right now with a friend so I might even be back there by the end of the year! There is so much to see and the food and wine scene is right on queue at the moment and spoken about world wide. If you haven’t been to Tassie before you are certainly missing out and if you are visiting Australia if you have the time you would be crazy to oversee it on your itinerary. 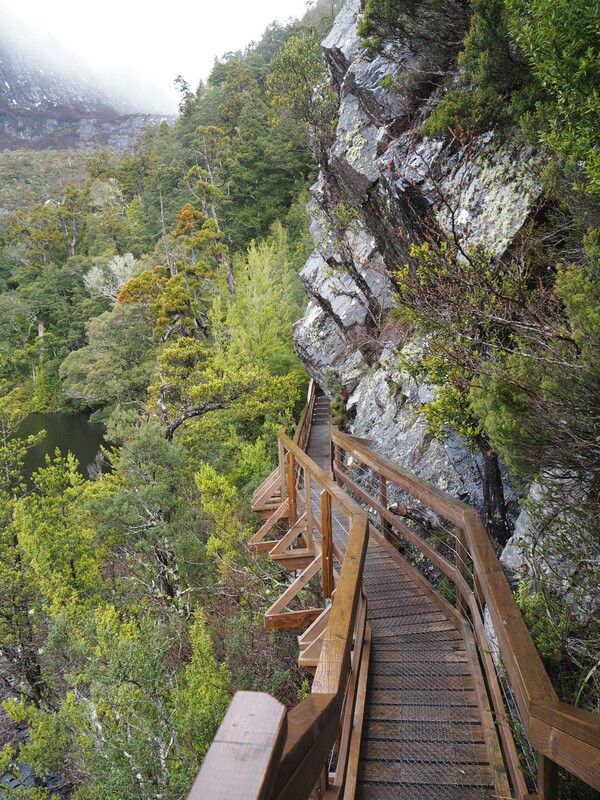 Have you been to Cradle Mountain, were you lucky enough to see the Cradle? Not everyone is! Tell me about it in the comments below? Looks beautiful! Another one to add to my ever expanding bucket list! I’d love to know how you manage work, kids, home, life and holidays? Superwoman! It really is a special place. What a shame you had such awful weather. I went in summer and it was glorious. We did the same walk and also got to the summit of Cradle Mountain, which was quite challenging and involved a lot of rock scrambling. That was waaaay back in 1998, long before I ever considered myself a hiker. I’d love to hike the Overland Track one day. Yes the fees are quite steep, we got the same when we went to Uluru last year. I think in Tassie there is a locals fee that is a yearly pass and you can get a $60 pass that covers 8 weeks also if you are staying a while but yes the extra costs are frustrating. I would like to think that I could do the Overland Track! I like bushwalking but I’m hopeless when it comes to climbs, I hate and whinge like a 2 year old too! I had planned to do a few of the shorter walks but the weather just wasn’t playing fair! I think it would be amazing in summer, just means I have to go back one day soon! Maybe next year and do that west coast like I have wanted to do for so long!